The United Nations is intensifying pressure on Southeast Asian governments that have been reluctant to come to the rescue of refugees and migrants stranded at sea following a crackdown on human traffickers. 1 A Rohingya child who recently arrived in Indonesia by boat sleeps inside a shelter in Kuala Langsa, Aceh Province, Indonesia, May 19, 2015. 2 A Rohingya migrant woman who recently arrived in Indonesia by boat lies on a pile of donated clothes at a shelter in Kuala Langsa, Aceh Province, Indonesia, May 19, 2015. 3 Bangladeshi men wash themselves in the sea near a temporary shelter in Langsa, Aceh province, Indonesia, May 19, 2015. Indonesia's foreign minister said that her country has "given more than it should" to help hundreds of Rohingya and Bangladeshi migrants stranded on boats by human traffickers. 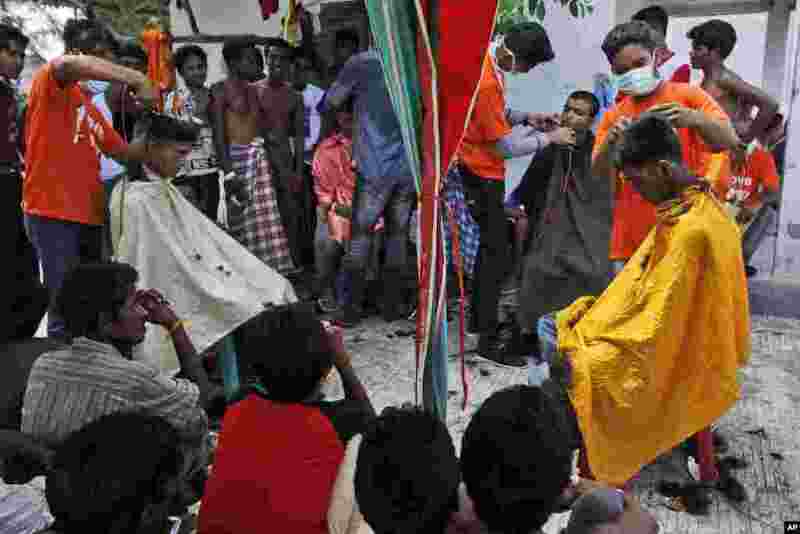 4 Ethnic Rohingya men take up offers of a free haircut provided by a local NGO at a temporary shelter in Langsa, Aceh province, Indonesia, May 19, 2015.